Promo period is from August 15, 2017 – September 30, 2017. Will purchase on ZALORA using the voucher code 247ANYTIME within the promotion period. The said voucher code 247ANYTIME entitles the customer to 15% discount for a minimum spend of Php 1,500 on ZALORA in a single purchase. Log in or register by Signing in via Facebook. Input customer information such as name, mobile number and delivery address. Enter promo code 247ANYTIME then click Apply. 4 winners, (1) ticket each will win a month membership pass from Anytime Fitness worth P6000 each. To be eligible for the Draw, the participant must fulfill the following additional criteria: i. All orders following the above mechanics must be valid and complete ZALORA orders. Cancelled, exchanged, returned, and fully refunded ZALORA orders will be disqualified. Deadline to earn raffle entry/entries for a chance to win the prize is until 11:59 PM of September 30, 2017. Raffle draw will be held on October 3, 2017 at 4:00 PM at the ZALORA Philippines head office at Level 2, Building B7, Bonifacio High Street, Bonifacio Global City, Taguig City with the presence of representatives from Department of Trade and Industry (DTI), Anytime Fitness and ZALORA Philippines. ZALORA Philippines and Anytime Fitness reserve the right, in concurrence with Department of Trade and Industry (DTI), to reject a participant if he / she is unable to satisfy the conditions set out in these promo mechanics. The ZALORA voucher code 247ANYTIME is applicable to participating brands except for brands and categories found on www.zalora.com.ph/faq-non-sale/. Anytime Fitness will be providing 4 membership passes to be used as a raffle prize. There will be 4 winners (1) ticket each. Tickets are transferable, but not convertible to cash or promotional items. Tickets can be claimed at the Zalora office. Claiming date to be set by Zalora. ZALORA Philippines and Anytime Fitness reserve the right to verify the eligibility of the winning entry. ZALORA Philippines will verify the winner’s order (via the ZALORA website or ZALORA app), whereas the order should be a valid complete order, with no cancellations, returns and refunds. Employees of ZALORA Philippines and Anytime Fitness, including their relatives up to second degree of consanguinity or affinity are disqualified from joining the promotion. By participating in the raffle, the winners agree to cooperate and participate in any advertising or publicity activities of ZALORA Philippines and Anytime Fitness relating to the draw. 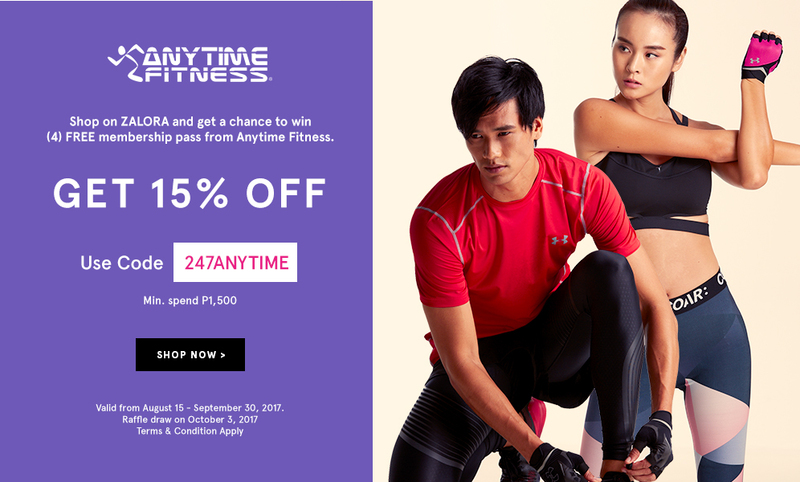 The winners agree that ZALORA Philippines and Anytime Fitness may publicize the name and photograph of the winners in such mode and manner as ZALORA Philippines and Anytime Fitness consider fit. Winner’s name and photograph may also be publicized in such mode and manners as ZALORA Philippines and Anytime Fitness consider fit, such as but not limited to, ZALORA Philippines’ Facebook (https://www.facebook.com/ZaloraPH), Instagram (https://www.instagram.com/zaloraph), and Twitter (https://twitter.com/zaloraph); The links provided are not exhaustive and there may be other publicity channels. ZALORA Philippines and Anytime Fitness reserve the right to verify the eligibility of the winning entry. ZALORA Philippines will verify the winner’s order (via the ZALORA website or ZALORA app), whereas the order should be a valid complete order, with no cancellations, exchanges, returns and refunds. Employees of ZALORA Philippines and Anytime Fitness including their relatives up to second degree of consanguinity or affinity are disqualified from joining the promotion. Per DTI-FTEB Permit Number 12683 Series of 2017.